And normal service is resumed. Lachlan has two bags to share with us and they are both pretty awesome. Come and have a look. I’ve wanted to send in a picture of my camera bag for awhile as I am a regular follower of you via web an Instagram etc so here it is. So a little about me, My name is Lachlan and I am from Australia, currently studying my second year of Film & Television studies. 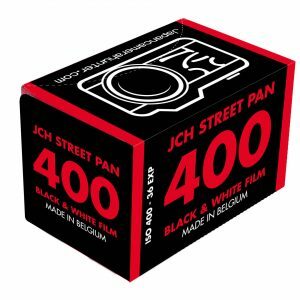 I shoot both digital as well as analogue but i prefer to stick with analogue as I love the process and connection involved with film. 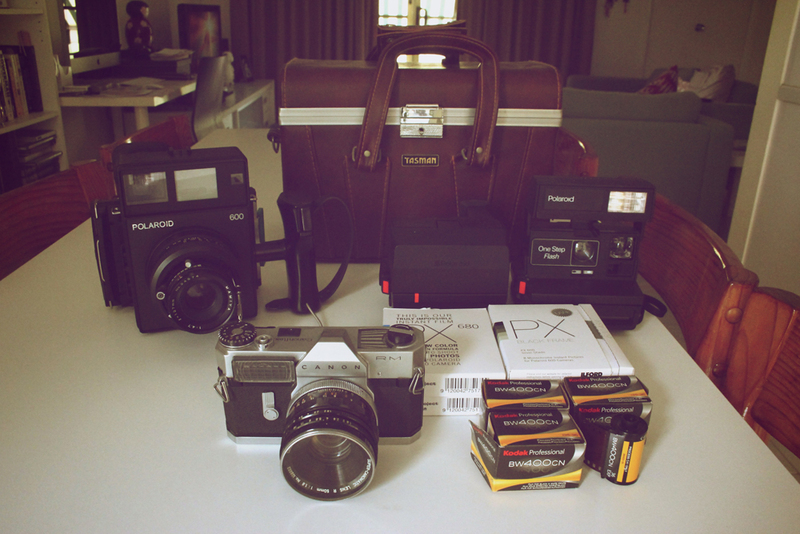 In my spare time from study, I collect vintage cameras with my grandfather. 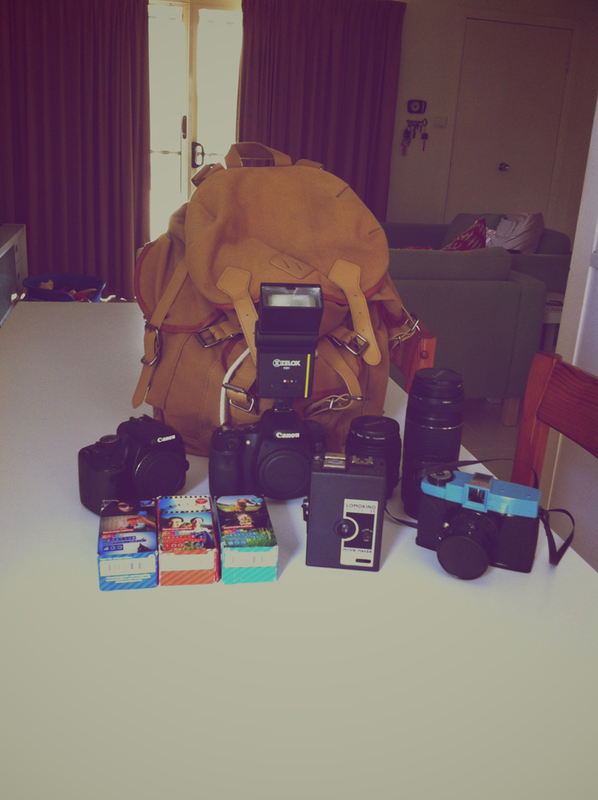 So after that bit about me, here is my camera bags. My favourite camera bag is this setup you can see in the first picture. 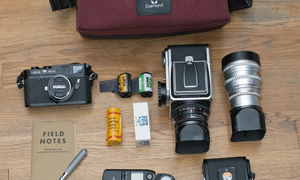 This bag is my film setup. It comprises of my favourite all time camera, a Polaroid 600 with Mamiya 127mm f/4.7 lens still to this very day in perfect mint condition. No scratches, marks or wear. 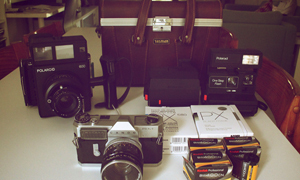 Not shown in this picture is my film that i use for the 600. 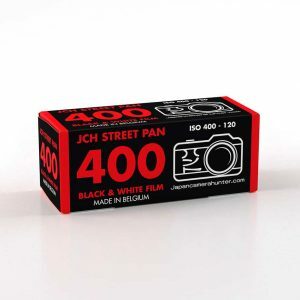 I use the Fujifilm fp-3000b as I love the beautiful shots that it with the nice contrast. The next camera is actually handed down from me by my Grandfather. A Canon Reflex RM attached with a 50mm f/1.2 lens in almost near perfect condition as he (being my grandfather) looked after this very well. 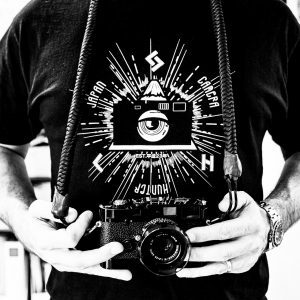 I shoot mainly Kodak BW400CN on this camera very regularly. Next up are my two Polaroid One Step Flash cameras. One being plain black (right side) and the other with the red stripe down the front. I generally have them pre loaded before venturing out. One with Impossible Project PX680 Color Shade and the other with the PX680 Silver Shade ready to capture either colour or black and white shots. To lug all this gear around, I pack this cameras setup into a fairly old (around the 70s) Tasman, brown leather hard case which is in perfect condition. 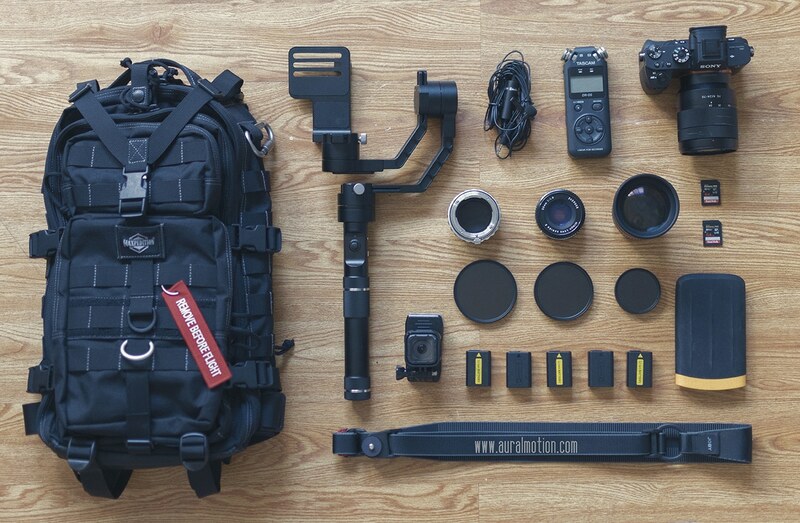 That is all for that camera bag, so here is my next setup. This setup is my cross between digital and analogue setup. I tend to use this setup when I am out and about at University as it is a lot lighter then my previous setup. 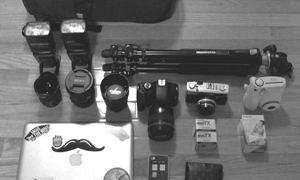 This features my main Digital camera which is a Canon 60D (in the middle) and my back up camera the Canon 400D. 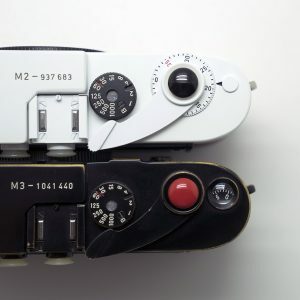 I have a growing set of lenses to go with these cameras. I have the 50mm f/1.4, a 70mm-300mm f/4 and the standard kit lens 18-55mm. 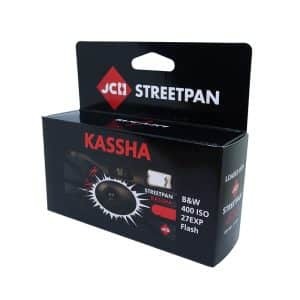 Also a xzelox speed light is apart of the kit. 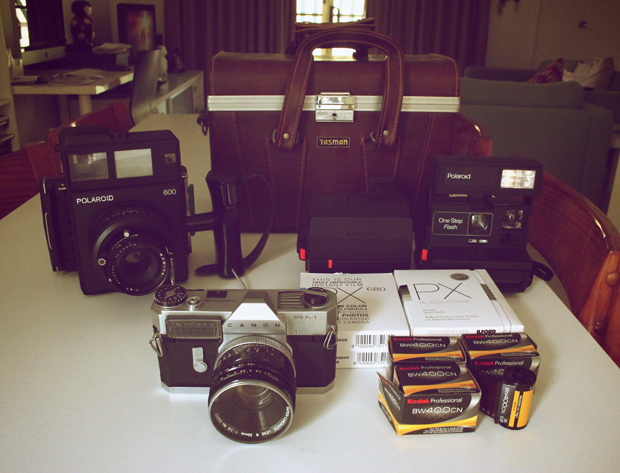 Next is the analogue half of my bag. I love to take around with me a Lomokino equipped with rolls of lomography 35mm film with a range of ASA/ISO settings to film short movie snippets of everyday life. my final camera that i carry around with my is the Diana F+ which, although i don’t use often still can come in handy if i want to take a quick shot on film. 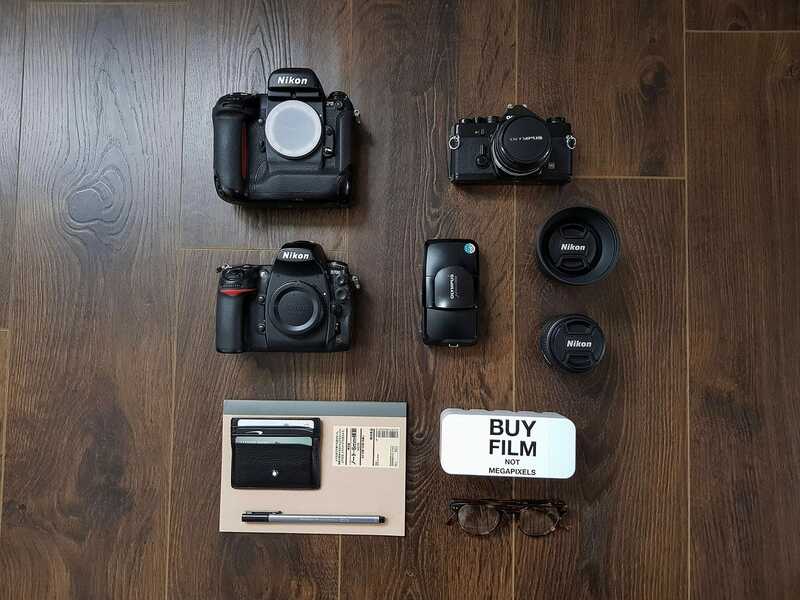 To carry this gear around i use a simple River Island backpack which is quite large and can fit all of my cameras plus accessories without any trouble. So that is all of my gear which i change around depending on where I am venturing out to. Thank for sharing your bags with us Lachlan. It is cool to see the two different set ups and how you chose them. Check out the links and make sure you guys come and comment.